Students who pursue a Land Surveying Certificate must already have a four-year degree in a field related to surveying such as civil engineering and want to become a licensed surveyor in Minnesota. You'll learn to gather information through observation, measurements, questionnaires, legal research and data analysis. You'll be introduced to the associated services of land surveying such as mapping; construction layout surveys; precision measurements of length, angle, elevation, area and volume; as well as horizontal and vertical control surveys; and the analysis and use of land survey data. All surveying-specific courses are offered on-campus and online. Geographic Information Systems (GIS) Lab that allows hands-on mapping training. Access to a variety of surveying equipment and the latest in surveying related software such as AutoCAD, ArcGIS, Pathfinder, Surfer, and STARNET. Undergraduate certificate aids in career advancement. 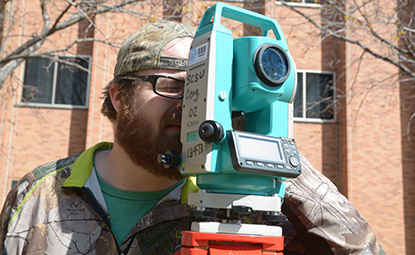 Only four-year degree surveying program in the six-state upper Midwest. Certain undergraduate and graduate certificates at St. Cloud State prepare students for employment in specific fields and do not result in a degree. Federal law requires publication of data associated with those programs of study, including approximate program costs, program length and employment statistics. The Minnesota State Chancellor's office has provided this report containing the aforementioned information for all required programs. Applicants to this program must complete and attach the Gainful Employment acknowledgement form (PDF) as a part of their application for admission.